Preheat over to 375 degrees. Cut squashes in half lengthwise and scoop out seeds. Brush with 4 tsp of coconut oil with 1/2 tsp of salt, black pepper to taste, 1/2 tsp coriander, 1/4 tsp cinnamon, 1/4 tsp nutmeg. Arrange halves on a baking sheet, cut side down. Roast 45 minutes until tender when pierced. Combine remaining 4 tsp coconut oil, 1/2 tsp salt, 1/2 tsp coriander, 1/4 tsp cinnamon and 1/4 tsp nutmeg with carrots, walnuts and ginger in a baking dish; toss to combine. Roast at 375 degrees for 35 minutes, stirring every 10 minutes when carrots are tender, stir in dried cheers and maple syrup. Roast for another 10 minutes, then remove from oven. While vegetables are roasting, place a medium saucepan over medium heat. When hot, add 1 tablespoon coconut oil. Add onion and saute for 2-3 minutes, until onion begins to soften. 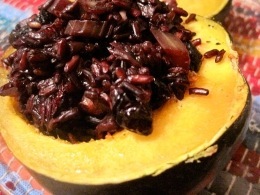 Combine rice with carrot mixture and fill acorn squash. Bring large pot to boil and cook cauliflower for 10 minutes. Drain cauliflower and transfer to food processer, add oil, roasted garlic and almond milk 1 teaspoon at a time and puree until smooth. Season with salt, pepper and rosemary. Put vinegar, mustard, pear and garlic in a blender with 1/3 cup water and blend until smooth, about 1 minute, to make the dressing. Cut mushrooms into chunks and combine in a large mixing bowl with 1/4 cup of the dressing. Spread mushrooms in a single layer on a rimmed baking sheet. Roast until tender, stirring occasionally, 20 to 30 minutes. While mushrooms roast, prepare quinoa. In a medium pot, bring 1 3/4 cups water to a boil. Stir in quinoa, cover pot, reduce heat to low and simmer for 15 minutes. Remove pot from heat and set aside, covered, 10 minutes more. Uncover and fluff quinoa with a fork. Combine mushrooms, quinoa, spinach, green onions, almonds, salt, pepper and 1/2 cup more dressing in a large, wide serving bowls. Stir to mix well. Mound the quinoa on your plate. 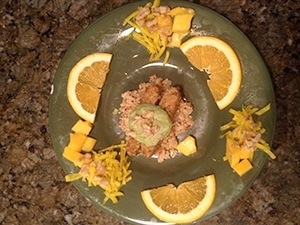 Add the citrus over top. Then the skewers of tempeh. Add the diced mango and walnuts along the edges. Add the beets in little mounds. Drizzle the Avocado cream over top the tempeh and dash a few more spices as you’d like. Directions: Place all ingredients in blender (I used my trusty Vitamix) and blend until creamy. After you have a nice sear add in the orange juice and cover with lid. Allow tempeh to cook for a minute or so. Remove lid and add some pepper and simmer until all the liquid has been absorbed or steamed off.